Introduction. Scripture is clear. Alcohol is a dangerous drug to be approached with great caution. Only alcohol creates drunkenness and all who are drunk are in sin. The Holy Spirit warned against “revelry and drunkenness” because “drunkards, will not inherit the kingdom of God” (Rom. 13:13; 1Cor. 5:11; 6:9-11; Gal. 5:19-21). We are commanded: “Do not be drunk with wine,” “for we have spent enough of our past lifetime in doing the will of the Gentiles — when we walked in drunkenness, revelries, and drinking parties.” (Eph. 5:18; 1Pet. 4:3-4). Not only are we warned against drunkenness, but also the wine and strong drink that create it. “Wine is a mocker, strong drink is a brawler, and whoever is led astray by it is not wise.” (Pr. 20:1). What makes wine a mocker and strong drink a brawler? The only answer is alcohol! Alcohol makes wine a “mocker” who “makes mouths at and scoffs.” Literally, wine is portrayed as sticking its tongue out at us and making scornful faces at our stupidity and folly as we drink it. All who are “led astray” which means “to swerve, to meander, to reel, to roll, or be intoxicated” are not wise. The testimony of the Scriptures. Hear the most definitive passage condemning wine that contains alcohol. The Holy Spirit revealed what the alcohol industry today doesn’t want known. Alcohol leads to woe, sorrow, contention, complaining and redness of eyes. While under the influence of alcohol, one can be wounded and not even know it. While it looks beautiful and sparkling while it is still in the cup and even goes down smoothly as it is drunk, it leads to dire things. The Holy Spirit revealed that in the end it will bite like a deadly serpent. All beverages containing alcohol mock us. When the mask is torn away, this "friend" has the hideous face of malicious deception. Like a cunning wolf, it wags its tail like man's best friend, but then bites and devours. Bidding us drink and be merry, but mocking us for our folly! The farther down the path of alcohol one walks, the further from wisdom they go. Since drunkenness is a sin and wine is the main portal leading to drunkenness, what relationship should the Christian have with it today? The obvious answer should be none! No matter how many Scriptures appear to teach otherwise, they will not contradict these. The testimony of Science. Many want to affirm that the problem is not the alcohol, but the lack of self-control in the one drinking. If the drinker is self-controlled and moderate, then these passages do not apply to him. Or as some affirm "It is OK to drink so long as you don't get drunk." Yet a study of alcohol and the human body reveals how illogical such thinking is. The next two charts were written by those who want to protect us against drunk driving. The first is for men and the second for women. Even having 1 to 2 drinks is dangerous and 3 is legally drunk. Only none is safe! The testimony of Civil Law. Romans 13 commands Christians to obey civil law. Let's look at Colorado law as an example. 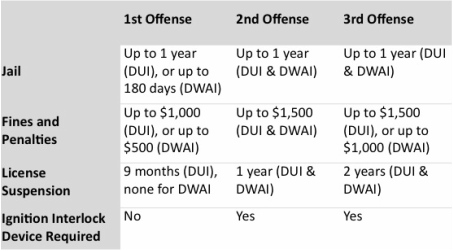 What are the penalties for a DWAI/DUI in Colorado? According to the next chart, if a Christian attempts to drive with 1-2 drinks, he is guilty of a DUI if .08% or above or DWAI with only .05%. Any time a Christian drinks his inhibitions have been compromised. When inhibitions are no longer intact, he is drunk in the eyes of God! 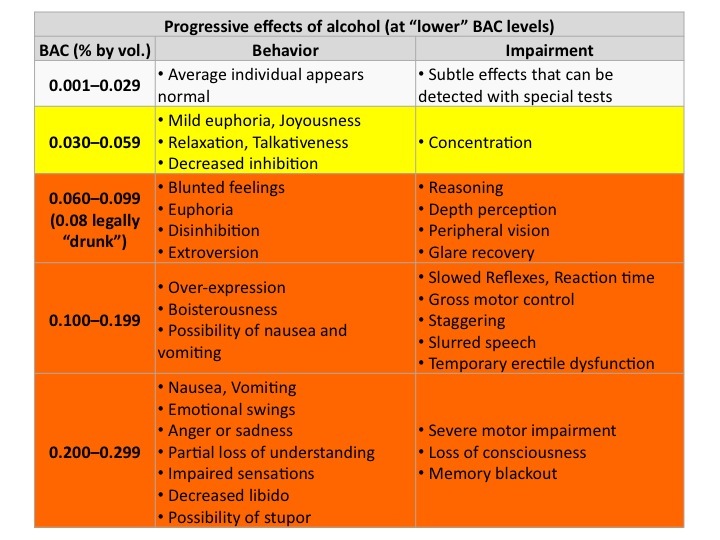 This is why alcohol mocks us and bites like a serpent. It is why those who are led away with it are not wise. Social drinking is therefore folly. It opens up possibilities that are impossible without alcohol. Would Noah and Lot have done such things? Conclusion. With all the beverages available today, it is impossible to find any reason to drink those which contain alcohol. Alcohol is man’s enemy. The further away from alcohol we are the closer we are to God and the closer we are to alcohol, the further from God we must go.